Juan Cuadrado is one of the most exciting players that has come out of Colombia in its recent football history. The dynamic winger, who plays his club football with Italian giants Juventus represents a new generation of Colombian players that have qualified for back-to-back FIFA World Cups in 2014 and 2018. Juan Guillermo Cuadrado was born in the war-torn Uruaba region on May 26, 1988. Cuadrado grew up in very difficult circumstances with his father said to have been murdered by an armed group as five year-old Juan hid under the bed in the family’s modest home in Necocli, Antioquia. He began his career at local side Atletico Uraba where he initially played as a forward. As a boy Cuadrado was physically weak and very skinny but possessed a devastating ability to dribble the ball and take on defenders. In hindsight, his great break was when he traveled to Cali to seek opportunities in football and met Nelson Gallego, who was managing youth teams in the region. 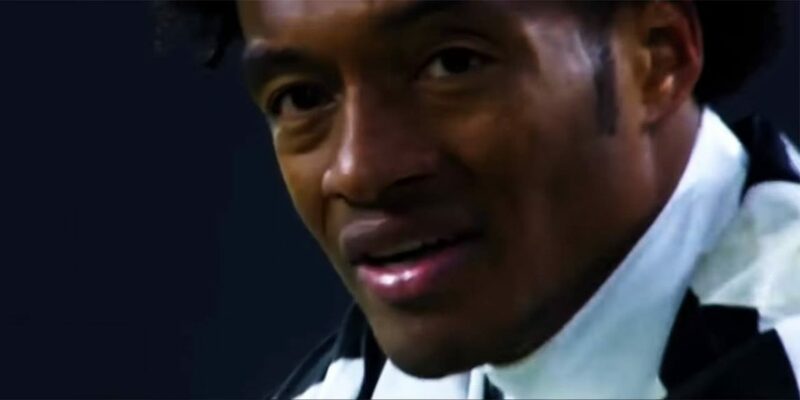 After arriving with his mother, Cuadrado told Gallego that “you have to help me, I’m not leaving here.” Despite Cuadrado’s pleas, Gallego reportedly offered him money to go home to Uraba before an intervention from his wife saw the 13-year-old take up residence with them. “My wife told me: if he plays well, you can help him,” said Gallego to El Tiempo. Gallego, who is currently preparing for the World Cup as assistant coach with Panama, says Cuadrado’s discipline, bravery and temperament allowed him to become a success story. The former youth coach also claims that up to this day, Cuadrado does not know what beer tastes like. Under the influence of the Gallego, Cuadrado improved, catching the attention of local scouts and he was picked up by Colombian second division side Rionegro, who he joined for a brief spell. Independiente Medellin manager Jose Pelaez gave an opportunity to Cuadrado following a recommendation from his friend Gallego and signed him in 2008, with the attacker remaining in Colombia’s second biggest city until 2009. On July 2, 2009 Cuadrado signed for Italian top-flight side Udinese for an undisclosed fee. After the move to Udinese, the national team called , as Cuadrado was given a starting spot in a match against Venezuela on 3 September 2010, scoring the opening goal of a 2–0 victory. At Udinese however, he was given limited opportunities and later went on loan to fellow Serie A side Lecce. Cuadrado made 33 appearances for Lecce, scoring 3 goals but saw his new team relegated causing him to return to his parent club. He was in the Colombian squad that reached the quarter-final of the Copa America in 2011 but only made one appearance in the last group game against Bolivia. On July 23, 2012 Cuadrado completed a temporary $1.2 million move to Fiorentina where he performed well, scoring five goals and providing five assists in a season that saw “La Viola” finish fourth in the league. His impressive displays prompted the club to invest further in the Colombian, buying half his registration rights for a fee of around $5.9 million in 2013 and later full ownership in June 2014 for an additional $14.1 million. A good run of form with Fiorentina stoked interest from Premier League club Chelsea with the Colombian star moving to Stanford Bridgein 2015 for a fee of $31 million, with Egyptian Mohamed Salah moving in the opposite direction. Cuadrado’s spell at Chelsea was not as successful as he may have hoped as he struggled to adapt to the Premier League, making 13 appearances and just four starts for the London giants. “What went wrong? The truth is, I don’t know,” he admitted. “I was always professional and I always trained very well. I didn’t play as much as I wanted, but I was always ready,” said Cuadrado to reporters when asked about his failure at the club. On August 25, 2015, Cuadrado moved to Juventus on a season-long loan deal and immediately rediscovered his form in Turin, prompting an extension of the loan deal the following year, eventually culminating in a permanent move to the club in May 2017. Cuadrado won back-to-back league and cup doubles in his first two years at Juventus and helped his side to secure a Champions League final berth in 2017, where they were defeated by Real Madrid. Despite missing a large part of the 2017-18 season through injury, Cuadrado made a return to action in April to pick up another double with the Italian giants. With Colombia enduring something of a drought in the aftermath of the 1998 World Cup, the emergence of the likes of Cuadrado, along with James Rodriguez gave fans hope that this new generation could get the national team back to the top table. Qualification for the 2014 World Cup marked just that, with Cuadrado playing a pivotal role in a qualifying campaign that saw Colombia finish in second place behind Argentina in the CONMEBOL South American section. A string of fine performances by Colombia at Brazil ’14 led them to a first quarter-final in the nation’s history with Cuadrado scoring one goal against Japan and winning the award for the most assists at the competition, registering four in five games. With the recent return of Radamel Falcao to the Colombian ranks, he, Cuadrado and James Rodriguez have formed what is a devastating three-pronged attack for the side. The man who came from humble beginnings in Necocli will again carry the hopes of the nation in attack as Colombia gears up for another appearance at world football’s biggest stage at Russia 2018.